Dr.Craig Venter is president of one of the firms that led the Human Genome Project. He is quoted as remarking that “We have only 300 unique genes in the human genome that are not in the mouse. This tells me genes can’t possibly explain all of what makes us what we are.” This statement from an individual so intimately involved in the molecular biology and biotechnology of DNA sequences suggests that we need to look beyond the mere “spelling” of our DNA and RNA when it comes to our health. Dr. Larry Dossey writes about three Eras of medicine that have progressed since the mid 19th century. Dr. Yasko simply describes Era I medicine as “if this, then that” medicine. This would include taking a specific herb to remedy a specific condition or an antibiotic to eradicate a bacterial infection. According to Dr. Dossey “Era I is good old everyday mechanical medicine, technical orthodox medicine. Drugs, surgery and radiation. Era I, which can be called “mechanical medicine” and which began roughly in the 1860s, reflects the prevailing view that health and illness are totally physical in nature, and thus all therapies should be physical ones, such as surgical procedures or drugs” (Dossey, L, Reinventing Medicine, HarperCollins, 1999). Era II medicine is how your mind affects your body. It acknowledges that stress and your frame of mind can have a negative impact on your body. It is what is commonly referred to as the Mind/Body connection. Very specific inflammatory mediators have been well characterized in terms of their ability to convey stress to the body. 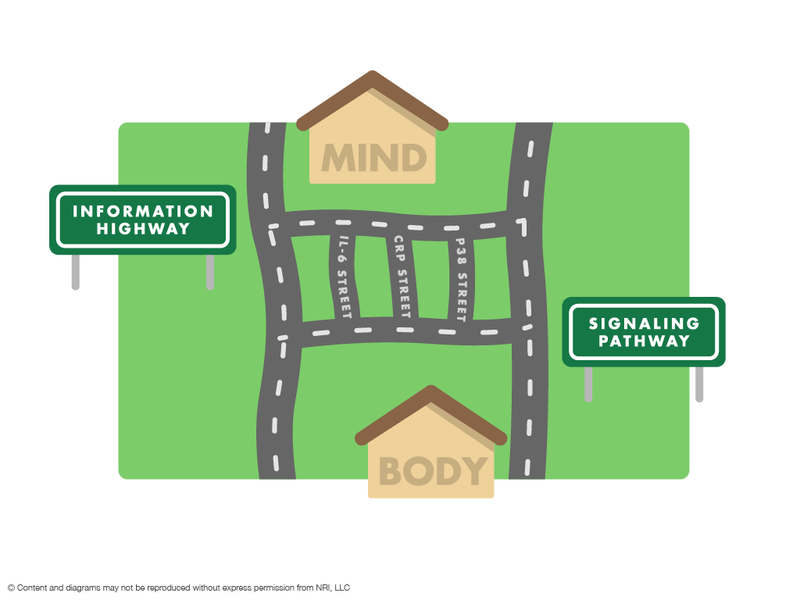 Mediators such as IL6, p38Map kinase and CRP are some of the information pathways that the mind uses to convert stress into harmful effects on the body. Scientific studies have reported that higher CRP levels were found in men in their 70’s with less social interaction as compared with men with more social interaction (Bottom Line Health, June, 2004). Elevated CRP is associated with levels of inflammation and is a risk factor for a number of inflammatory disorders including heart disease, colon cancer and Alzheimer’s disease among others. A study published in the very prestigious journal Proceedings of the National Academy of Science in July 2003 reported that after following individuals over a six year time period, increases in IL6 have been correlated with stress. A series of papers in this same journal in July of 2004, underscored the relationship between stress and yet another inflammatory mediator, p38MAP kinase. These types of relationships between well defined concrete, measurable inflammatory mediators and the ability of the mind to trigger the release of these mediators falls under the domain of Era II medicine. Keeping that “in mind” you should never underestimate the power of spirituality or positive thoughts and the impact it can have on your health. Patients with osteoarthritis who believed in their ability to perform tasks were less debilitated after 3 years than those who were less confident (Loucks, Bottom Line Health, vol 18, June, 2004). Conversely, research from McGill University (Spirituality and Health, March/April, 2004) has shown that brains from senior citizens with low self-esteem had atrophied leading to a higher incidence of memory loss than those who felt good about themselves. People scoring higher on anxiety tests were 25% more likely to have premalignancies (Clinical Pearls, May, 2004). Two separate studies support a correlation between prayer and the ability to become pregnant (Cuvelier, M. Psychology Today, Jan, 2002). Your frame of mind, as evidenced by your spirituality, appears to increase life span (Bottom Line Health, May, 2004). This mind/body effect can be very powerful even when it comes to surgery. In a study involving 30 patients, only 12 received the actual surgical treatment; the other 18 only received a sham surgical procedure. Neither the participants, nor the medical attending staff knew which procedure each participant received. One year later, the 10 patients who thought they received the transplant reported better physical, emotional, and social functioning than the 20 who believed they had received the sham surgery. The medical staff also reported improved outcomes in the patients who believed they had received the treatment. Of the 10 who were doing better, and believed they had received the actual surgical procedure, only 4 of them had in fact received the treatment. This study helps to confirm that believing in a treatment and the power of positive thinking help to make it more effective (McRae, C., Arch Gen Psychiatry, April, 2004). “Era II began to take shape in the period following World War II. Physicians began to realize, based on scientific evidence, that disease has a “psychosomatic” aspect: that emotions and feelings can influence the body’s functions. Psychological stress, for example, can contribute to high blood pressure, heart attacks, and ulcers. This was a radical advance over Era I. Era II is involved any time we talk about mind/body events within the person. My mind affecting my brain affecting my body, for good or ill. It’s confined to the present moment, it’s “here and now “medicine, it’s local” (Dossey, L. Reinventing Medicine). Era III medicine is how “my” mind affects “your” body. This is an area that is not completely understood; yet the power of belief or prayer and its affect on healing has been proven to occur. “Era III is mind/body medicine with a different slant. The recently developing Era III goes even further by proposing that consciousness is not confined to one’s individual body. Nonlocal mind — mind that is boundless and unlimited – is the hallmark of Era III. An individual’s mind may affect not just his or her body, but the body of another person at a distance, even when that distant individual is unaware of the effort. You can think of Era II as illustrating the personal effects of consciousness and Era III as illustrating the transpersonal effects of the mind. It’s important to remember that these eras are not mutually exclusive; rather they coexist, overlap, and are used together, as when drugs are used with psychotherapy, and surgery is used with prayer” (Dossey, L. Reinventing Medicine). We do know from studies being conducted around the world that there are hard facts and statistics that support the idea that Era III medicine is a reality. Studies at the Princeton Engineering Anomalies Research Laboratory have been conducted for over a decade by the ex-Dean of Engineering Dr. Robert Jahn and his colleague Brenda Dunne. In their remote-sensing experiments, the scientists had one person in Princeton attempting to mentally send a computer-selected image to a person 6000 miles away. Significantly, the receiver was able to get the message in great detail. This is mind operating outside of our conventional views of space and time. Similar instances of distance communication are seen in nature. “When a queen ant is spatially separated from her colony, building still continues fervently and according to plan. If the queen is killed, however, all work in the colony stops. No ant knows what to do. Apparently the queen sends the building plans” also from far away via the group consciousness of her subjects. She can be as far away as she wants, as long as she is alive. In man hyper communication is most often encountered when one suddenly gains access to information that is outside one’s knowledge base” (http://www.fosar -bludorf.com). So too we know that distant prayer, or if you prefer positive thoughts or affirmations, have been shown to affect a number of health conditions. Research at Duke University Medical Center in Durham, North Carolina studied the effects of prayer on patients undergoing cardiac procedures such as catheterization and angioplasty. Patients receiving prayer had up to 100% fewer side effects from these procedures than people not prayed for (Archives of Internal Med. Oct., 1999, Krucoff, American Heart Journal, 142, 2001, Grunberg, Cardiology Rev., 2003). A recent article from the ordinarily “very Era I medical journal”, the Journal of the American Medical Association, noted that seeing a loved one in pain activates some of the same brain areas that are mobilized when we experience pain ourselves (Journal American Medical Association March 17, 2004). A case of my mind reacting to your body. One would need a guide to navigate uncharted areas through the African rain forest as it would be impossible to get to your destination without that guide who is familiar with the territory. Similarly, just because we don’t know the way to get there, does not mean that a place does not exist. In terms of Era III medicine we do not have to know exactly which roads to transverse to arrive at the final destination, just simply to acknowledge that the destination and the roads do exist. For some it is a place they would prefer not to even attempt to travel to, and we must respect that choice. So what you might ask does all this have to do with RNA? The point is that seemingly unconventional pathways do exist even if we do not yet know what they are or we do not fully understand them. It is sufficient to be open minded and be aware that they may in fact have an impact on our health. For those who are skeptics it should be intriguing to now learn that only 2% to 5% of the genome encodes protein. In other words as far as we know at this time, only 5% of the DNA in each of our cells, that same DNA that is long enough to stretch all the way to the sun and back again, is used for anything that we would consider useful. Among the 5% that is actually used there is a high degree of similarity between diverse species. An in depth analysis of the conservation of genes between species suggests “…the existence of a selective force in the overall design of genetic pathways to maintain a highly connected class of genes” (Stuart, J. Science, Oct, 2003). As described in the article “So Much Junk DNA In Our Genome” (Ono, S. Brookhaven Symp Biol., 1972) approximately 95% of our DNA is not utilized to make proteins and hence must be “junk”. However, recent work has shown that this so called “junk” DNA is more highly conserved between species than the other 5% that is used to make proteins. The high degree of conservation between species of this other 95% suggests that there is an important function to these regions that has not yet been determined (Dermitzakis, E. et al, Science, Nov, 2003). Former senior computer systems designer, now turned author, Gregg Braden demonstrates in his book The God Code, that “When correlated with an ancient alphabet, the code of all life becomes a translatable message in our cells” (Braden, G., The God Code, Hay House Publishers, 2004). The role that our DNA may play in communication is confirmed by recent discoveries involving dolphins. “Beyond being life’s blueprint, DNA plays a powerful role in newly discovered communications between dolphins and humans, according to a team of Cetacean (dolphin and whale) researchers at the Sirius Institute on the Big Island of Hawaii. An ongoing study there shows these marine mammals receive and transmit sound signals capable of affecting the genetic double helix…using natural biotechnology DNA is activated, new research shows, by waves and particles of energized sound and light which, more than chemicals or drugs, switch genes “on” or “off” (Tetrahedron, Oct 6, 2004). Russian scientists have taken this premise a step further. Scientists in the fields of biophysics and molecular biology have collaborated with linguists and geneticists to study this 95% “junk DNA”. The results of their work suggest that DNA is not only responsible for the physical construction of the body but that it also serves as one huge data storage and communication system. The Russian linguists found that this highly conserved 95% of DNA that was apparently useless followed the same rules as all human language. “To this end they compared the rules of syntax (the way in which words are put together to form phrases and sentences), semantics (the study of meaning in language forms) and the basic rules of grammar. They found that the alkalines of our DNA follow a regular grammar and do have set rules just like our languages” (Fosar, .G. and Bludorf, F. Vernetztw Intelligenz, March, 2001). The results of this work may help to explain aspects of Era III medicine as well as certain facets of clairvoyance, intuition, spontaneous and remote acts of healing. This 95% to 98% “junk DNA” that is not utilized to make protein is a situation that may be unique to certain species. Bacteria, for instance, use the majority of their DNA for protein production. This has led to the suggestion that the function of the majority of the DNA is to make RNAs that may be involved in communication and cellular regulation. “Less than 2% of the 3.2 billion bases in the human genome code for proteins…Does this suggest that the reason for the ‘superiority’ of humans lies in the 98% of the genome that does not code for proteins? Is it not conceivable that the end products of many mammalian genes are not proteins, but RNAs?…Is it conceivable that certain RNA molecules are the actual creators and controllers of life?” (Pieztch, J. Understanding the RNAissance, May, 2003). Regardless of whom we quote we come to the same conclusion. We can take advantage of this inherent communication capability within our genes to talk to our cells for optimal health and wellness. but not sure how to start? 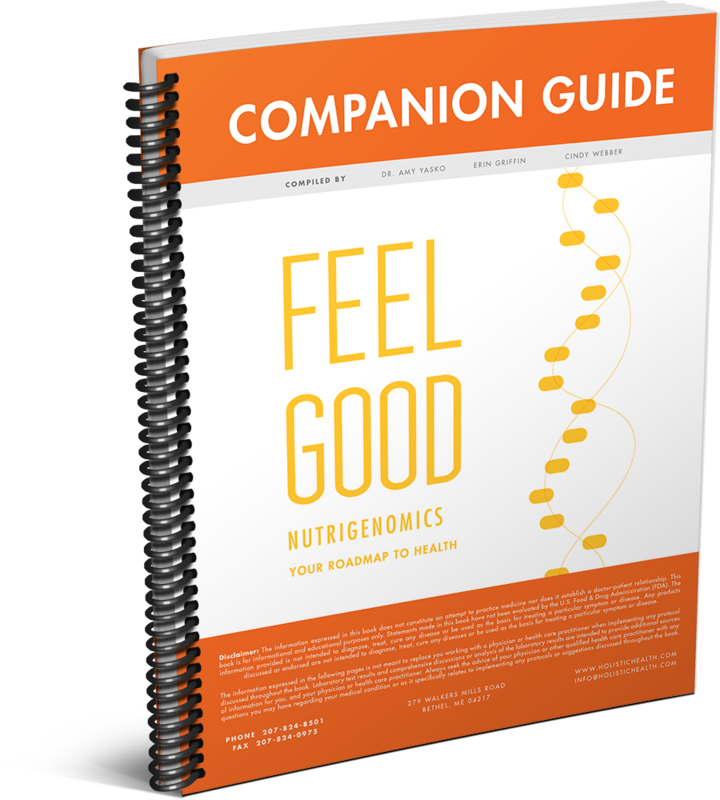 SNPs, biochemical testing, Dr. Amy’s suggested dosages, and more! Copyright © 2016 NRI, LLC. All rights reserved. This work, in whole or in part, may not be copied nor reproduced without express written permission of the author.